This still camera is exciting because it has a single large CMOS imaging sensor, which means the depth-of-field is similar to a film camera rather than a typical camcorder with small chips. And it records Quicktime 1080p HD at 30 fps, around 48 minutes to a 16 GB card, or, output through HDMI (no audio though) to a portable recording device (which one?). The format is H.264 at 38.6 Mbits/sec, which should look amazing. And, the low light performance looks great. It will be around $3500 with one lens, more as you add lenses. There are some questions, like if it overheats when shooting video, like some other still cameras, and the best audio solution. One thing to keep in mind when watching this spectacular footage is that this dude could have shot something beautiful with a $69 Fisher-Price camera. When you are a master of lighting and cinematography, it’s not hard to make any camera look great. However, the shallow DOF is undeniable, and the general color rendition excellent. Among the many advancements in Canon’s new EOS 5D Mark II camera is the Company’s proprietary DIGIC 4 Imaging Processor that powers the camera’s fast 14-bit analog-to-digital conversion for smooth color tones and exceptional gradation. 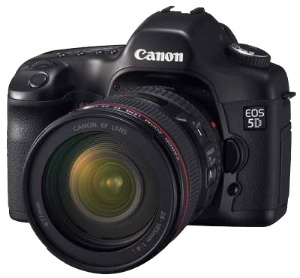 The Canon EOS 5D Mark II Digital SLR offers a full-frame 24 x 36mm, 21.1 megapixel CMOS sensor. The camera includes a 15-point Autofocus (AF) sensor with nine selectable AF points plus six additional Assist AF points (three center AF points sensitive to f/2.8 lenses) with enhanced light source detection and AF microadjustment for greater autofocus performance. The EOS 5D Mark II camera also features a large, clear 3.0-inch Clear View LCD screen with 920,000 dot/VGA resolution, four times the pixel count of the EOS 5D camera’s 2.5-inch screen, for enhanced clarity and color when viewing images. The new camera is equipped with a high-performance, high-magnification optical viewfinder providing 98 percent coverage. The EOS 5D Mark II will record video up to 4GB per clip or a maximum continuous movie capture time of 29 minutes and 59 seconds, whichever comes first. Depending on the level of detail in the scene, a 4GB memory card can record approximately 12 minutes of video at full HD resolution or approximately 24 minutes in standard definition[i]. Video clips are recorded in .MOV format using an MPEG-4 video compression and sound is recorded using linear PCM[ii] without compression. The new camera features an input terminal for external stereo microphones as well as a built-in monaural microphone for convenience. To help show off those fantastic movies as well as still photos, the EOS 5D Mark II camera includes an HDMI (High-Definition Multimedia Interface) output to display crisp, clear images on a High-Definition TV. This will actually be better than the all time famous RED Camera. Like the RED Camera. This unit does not record Audio. So as long as you have a secondary audio recording system this camera will out perform any other in a HD camera. Does this mean Canon has something newer coming out for their high end HD camera’s? We will see in the next 3 months. Im sure even myself will be purchasing this beast for the penny’s they are listing this camera for. Yesterday I was told I should expect to pay no more than $2000 canadian for the body. We were really excited about the project and what Vincent had actually accomplished. Impressed so much so that we were able to coordinate a podcast interview with Vincent and also get a Q&A session to boot. We really enjoyed the whole process, was fun hope you enjoy! Yes, you will pay a bit over 2k. The camera retails for 2600 usd, not to mention the expense of lenses if you don’t have them already. The camera also has an aux input for better mics. I use my RODE SVM on the hotshoe to do the audio sometimes and it’s great!